There are at least two benefits that come from looking through the archive of Polish literary scholars’ contributions to literary theory. The first is reading “founding” texts which, through their influence, reception, and the inspiration they have thereby generated, come together as links in the chain forming the main line of development of Polish literary theory. The second is being reminded of forgotten texts or those never adequately mastered, which are bold, creative, and revolutionary in their originality; having encountered them, we are anxious to bring them into the consciousness and memory of Polish literary scholarship and assign them a rank befitting their true worth. One work that certainly demands to be introduced into wider circulation in this way is the 1928 book Teoria poetyki (Theory of Poetics) by Konstanty Troczyński – a doctoral thesis written by a 22 year-old (whose committee featured Professor Tadeusz Grabowski as his advisor, and Professors Florian Znanecki and Michał Sobeski as his readers) who had recently finished a double degree (in sociology, taught by Znanecki, and Polish Studies, taught by Sobeski) at Poznań University, not published in its entirety during the author’s lifetime. Although Stanisław Dąbrowski wrote in his monograph on the life and work of the Poznań literary scholar published in 1988 that “All of Troczyński is worth remembering,” and that remains no less true today, Troczyński’s Theory of Poetics is particularly essential to remember. The first reason for this is that literary scholars who know the great Poznań scholar’s other books, which are, we should note, the result of impressively efficient work, consisting of five tomes of literary scholarship written over barely a decade (Rozprawa o krytyce literackiej [Study of Literary Criticism], 1931, Zagadnienia dynamiki poezji [Problems of the Dynamics of Poetry], 1934, Od formizmu do moralizmu [From Formism to Moralism], 1935, Elementy form literackich [Elements in Literary Forms], 1936, and Artysta i dzieło. Studium o Próchnie Wacława Berenta [Artist and Work. A Study on Wacław Berent’s Mould], 1938) should also become acquainted with the source or “nucleus” of the theoretical insights that he tirelessly developed and refined in his later works. Thus equipped with knowledge of Theory of Poetics as a part of their interest in Troczyński, they can trace the evolution of the scholar’s views as well as the continuity of his basic intentions and purposes, as a literary scholar who remained faithful to the fundamental methodology he developed independently at the beginning of his career. Secondly, recalling Theory of Poetics is a worthwhile undertaking because it is important to complete our picture of the anti-Positivist turning-point in Polish literary scholarship, which arrived at a position, on the one hand, symptomatic of intellectual currents aimed at shaping the methodological foundations of the humanities, while being, on the other hand, skeptical toward the hasty (or even, according to Troczyński, “erroneous”) conclusions drawn by some initiators of the anti-Positivist methodological revolt. In his text, Troczyński was not primarily “reacting to the arguments of the turning-point,” but he did respond to them with a quick and independent critical reaction, consciously entering into a literary polemic with the idiographic arguments of the Badenites and building a formalist (pre-phenomenological and pre-structuralist) response, different than that of the creators of the “understanding humanities,” to the needs of early twentieth-century literary scholarship. The greatest contributions to the cause of introducing Troczyński’s debut into literary scholarship have been made, naturally, by the competent authors of solidly edited critical works by the Poznań scholar Stanisław Dąbrowski, thanks to whose efforts Theory of Poetics was first published in its entirety in 1997 (as part of Troczyński’s Selected Writings) and Seweryna Wysłouch, who, in editing a book of Troczyński’s works decided to present his text in instructive juxtaposition with passages from his later texts, showing (also in her incisive introduction to the finished selection of works) the continuation of Theory of Poetics in subsequent studies by the scholar as a theorist of poetry and commentator on literary texts, adapting into his interpretative practice the formalist principles of his independently developed methodology. The point of departure for Troczyński’s reflections as the author of Theory of Poetics is an awareness of the functioning of the humanities in a situation of crisis for literary scholarship, the result of chaos in the definition of its object, divergence of methods of description and classification of literature, and a lack of clear and unambiguous concepts (p. 35). This situation, the author concludes, thus necessitates both revision of the methodological premises on which previous literary scholarship was based and construction of new scholarly methodological principles in keeping with the nature of the object of study. The specific nature of Troczyński’s response to the crisis in the humanities consists in the fact that his project for literary scholarship is a polemic with both Positivist geneticism, and the postulates of those who initiated the anti-Positivist turning-point – the creators of the Baden school (Windelband and Ricker), who posited a distinction between human and natural sciences in terms of an opposition between nomothetic and idiographic languages. To defend his own literary theory project, Troczyński adopts a “consciously unambiguous stance” (p. 41). Because he understands his task as the duty to construct an argument whose basic purpose is not meticulously performing a complete survey of other people’s positions, (as in the method called “historical”), or conducting a defense of his own theses by consistently situating them in relation to his opponents’ views (as in the “polemical” method), but rather proposing (using the “constructive” method) a coherent scholarly proposal for the study of literature, offering a solution to its crisis and resolving hitherto insurmountable dilemmas and paradoxes not dealt with by the previous approaches named. “Thus the task of the present work is the reconstruction of the philosophical foundations of poetics, that is, the definition of the object of its study, the resolution of the main methodological and cognitive issues of poetics, that is, the definition of the tools and methodological positions in the cognitive analysis of facts, and then the indication of the basic problems of poetics, outlining the methods of resolving them, and finally, a definition of poetics as a science, and designation of its position in scholarly thought in general and in scholarly considerations of literature in particular” (p. 41). In opposition to Positivistic Tainism, Troczyński thus intends to collaborate with others in effecting a transformation of literary studies, which “in place of the study of the literary text as a separate sphere of the reality existing outside the text” will posit “the study of the text as a separate sphere of human reality, i.e., as a work of art.” The basic concept of such study will be constituted by “the shape, the form of artistic expression objectively conditioned by each text” (39). A literary text is, in the position taken by the methodologies deliberately overthrown by Troczyński, determined by the differentiated elements of its genesis; this motivates the creators of such methodologies to adopt languages that justify such determinisms. As a result, they conduct what he claims are unauthorized studies of literary texts as the results of: a) psychological determinants; in this context “each literary phenomenon is treated as a reliable, certain image of an experience and of the writing subject’s psyche” (p. 50); b) philological determinants: here, literature is treated as if it were “created by the nation” and the purpose of its study is seen as the articulation of “the history of the nation’s ideals and feelings,” in order to “define the individual nature of the nation’s psyche and its structure”; or c) historical determinants, related to the philological kind; literature is treated as “expressing the age,” boiling down to a commentary on political history. All of these methodological approaches impose “the study of the text as a source of knowledge of some reality existing outside the text, of which the text is the expression” (p. 56), whereas the task of the new, “pure” (as Troczyński defines it) poetics is “to examine the text as a ‘separate sphere of reality’” (p. 56), as it is occupied with “the literary text only as a work of art, independent of the author, social milieu and historical epoch” (p. 57). According to the Poznań scholar, that only becomes possible when literary scholarship takes the position that the object of its interest is not a fact external to itself (here Troczyński is speaks in unison with the Baden School and Dilthey), but belongs to the tools at its own disposal and is developed by its own scholarship, is created and thus in essence abstract, a result of the selection of facts (here Troczyński diverges from the conclusions of the “understanding humanities”). While the purpose of the scholarship of the methodological tendencies overcome by Troczyński was, as he put it himself, “photographing reality from as many angles as possible and conveying experience as fully as possible” (p. 57), the new approach to literary studies, postulated and evidently inspired by conventionalism, positing that “the world of science and the world of concrete experience do not relate to each other as an object and its copy” (p. 57) and recognizing that “in scholarship there is also a large amount of creativity” demands that poetics take responsibility for literature, which in terms of absolutizing its ambition prepares (out of poetics) its own object of study. Reality (as an externally, objectively existing dis-order) and scholarship stand, according to the most general and basic assumptions of this theoretical project, in opposition to each other. That is because the scholar or researcher’s position in favor of “the path of selection by choice and systematic ordering of experience” refers to “activities [that] in fact distance the world of learning from the world of concrete things, that is, the actually, objectively existing chaotic maelstrom” (p. 58). But putting the problem in these terms and accepting these assumptions is not only a step forward in literary scholarship, but the first criterion for properly establishing literary studies as an authentically scholarly field, since the “ideal of the versatile study of material and exhaustion of its concrete contents is not only not something cognitively higher than one-sided specialized sciences, but is fundamentally an unscientific postulate” (p. 58). The abstract nature of the object of study thus makes possible and is a condition for the discipline’s becoming scholarly in the first place, and therefore drawing the young scholar away from accepting idiographic approaches, which represent a “misunderstanding” (p. 67). Such approaches, by advancing the individual element as the final goal of knowledge, opposing the concrete whole of the work to the artificiality of all kinds of abstract divisions and schemata, and making accusations against analysis that it destroys the unity of perception, fail to respect the fact that the grasp of the individual element is only possible due to previously having grasped the features common to a given class of objects, repeated and therefore schematic. Those features, for their part, can be identified only through procedures (oppugned by idographism) of systematization and analytical comparison. Thus “we can risk the statement that an idiographic formulation is impossible without a previous nomothetic […] analysis of the facts” (p. 67) and as a result there is not “sufficient condition” to employ non-idiographic methods only within studies of the reality of nature. The humanities and the natural sciences are thus only outwardly different, since in both areas of scholarship “our cognitive postulates are not deductively drawn from the facts examined, but are implied and, without prejudging the essential nature of the reality under examination, are only our cognitive tools for its intellectual elaboration. In the world of nature as well, objectively speaking, absolute and individual creativity is possible; if we know nothing of it, it is only because our knowledge of nature has postulated the negation of such facts” (pp. 68–69). The unity of the scientific method common to the humanities and the natural sciences (as subject to the same general directives and postulates) thus converges in Troczyński’s proposition with the Positivist rule of “unity of method of knowledge.” That method is not, however, based – as in Positivistic science – on the study of the genesis of phenomena for the purpose of their description and explanation, and is not distanced from the inclusion in science of considerations of value. On the contrary, the postulate of humanities which have reconsidered both the experience of Positivism and the main arguments made by Dilthey and the Baden School, is based on the requirement that a phenomenon be abstracted with regard to its genesis, and furthermore, its examination from the point of view of artistic value. What gives literary scholarship its specificity is not a methodological orientation generally different from the one required in the natural sciences, but the specifically peculiar object of study defined within that approach. This object of study, according to the author of Theory of Poetics, is constituted through the search for its main characteristic, basic to the initial phenomenon (treated as “material”) without taking into account its secondary features or “accessories” (p. 61). That is the only way to satisfy individual disciplines’ aspirations toward delimitation and distinguish the class of literary texts from other kinds of texts. That “character” of the work (as its “form,” not the “content” it “contains”) is therefore the object of literary studies as a scholarly discipline. What, then, is the literary text in Troczyński’s understanding? And can it fit into literary scholarship as an integral whole? In averring that the method of studying literary texts must be formal (rather than normative), Troczyński, takes the creative process, that is, the phenomenon of artistic activity, as his point of departure (drawing the inspiration for his methodology from Florian Znanecki’s Wstęp do socjologii [Introduction to Sociology]); this process differs from every other type of activity in that it is accompanied by “the consciousness of creating something intentionally fictive, not having previously existed, and brought to life by fashioning” (p. 62). The autonomous nature of the result of the artistic act and, by the same token, its fictive nature, is made complete in the course of a two-stage process of “objectivization.” In its first stage, the writer adapts to his own psychic states as to something objective relative to his own subjectivity, and in the second he gives expression, using language material, to the results of that operation. As a result, the literary work is “a text containing a consciously composed reality, constituting a new <internal> reality, that is, containing an artistic fiction” (p. 62); “thus only texts that contain a consciously created fiction, i.e., that possess artistic value, constitute material for literary study” (p. 63). Henryk Markiewicz posits the thesis that Troczyński was the first scholar in the history of Polish literary theory to formulate a definition that proclaims fiction as a basic category for defining literature. The determinant of literariness is thus a consciously created fiction, which simultaneously constitutes the work’s artistic value. The object of study for poetics is, on the other hand (Troczyński scrupulously and consistently clarifies, thereby building a coherent and complete system of problems and concepts comprising this scholarly discipline) the “form” of that fiction, and not its “essential quality,” since – he writes emphatically – “the study of literature must nevertheless limit itself to the formal plane, examining only literary art as form and shape without entering into interpretation of its essence,” a task that must be left to literary criticism. To put it forcibly, poetics is interested in the literary work purely as a work of art. A literary fiction can thus be grasped from three perspectives: literary criticism (when the literary work is interpreted as, for example, an expression of the author’s psychological conditioning, a social project, a stimulus toward philosophical thoughts, and so on) and literary scholarship (which is interested only in the aesthetic form of the literary work) based on two components: a theoretical one (at one point, the “morphology of poetry,” later, “analytical study of literary elements and their typical arrangements” – p. 70) and a historical one (studying the “dynamic of poetry” – meaning, changes taking place in literature “by way of their inclusion in the objective process of development of corresponding literary forms” (p. 106). As can be seen in this pellucid diagram, poetics, according to Troczyński, is strictly the study of form, of the shape of the literary work, “eliminating the matter of content, i.e. the contents of the work, as extra-aesthetic and impossible to grasp theoretically” (p. 110). Matters concerning the content of literary works are dealt with – as the author of Theory of Poetics writes in a summary to his considerations – by “the history of literature […] in its studies of the relation of form to the content expressed” (p. 110). Troczyński thus situates poetics (here understood in its broad sense – as literary theory) next to literary history, because they represent two branches of literary scholarship, which, as he astutely observes, “mutually complete each other: theory draws materials and factual data from literary history, while literary history draws concepts, generalizations, and laws from theory” (p. 110). Form, constituting the object of inquiry for poetics, demands that the inquiry concern itself with both dynamic and static formations, in Troczyński’s view. 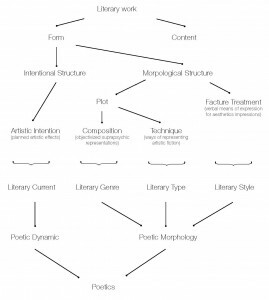 According to his model of poetics as a discipline, that signifies a need to study both variable, authorial intentional structures (which allow us to identify and describe literary currents), and – most importantly – morphological structure, within which we must include plot (a fundamental element of a text, determining the difference between literary and other forms of utterance) and facture treatment (the linguistic shape of literary texts, underappreciated by Troczyński). 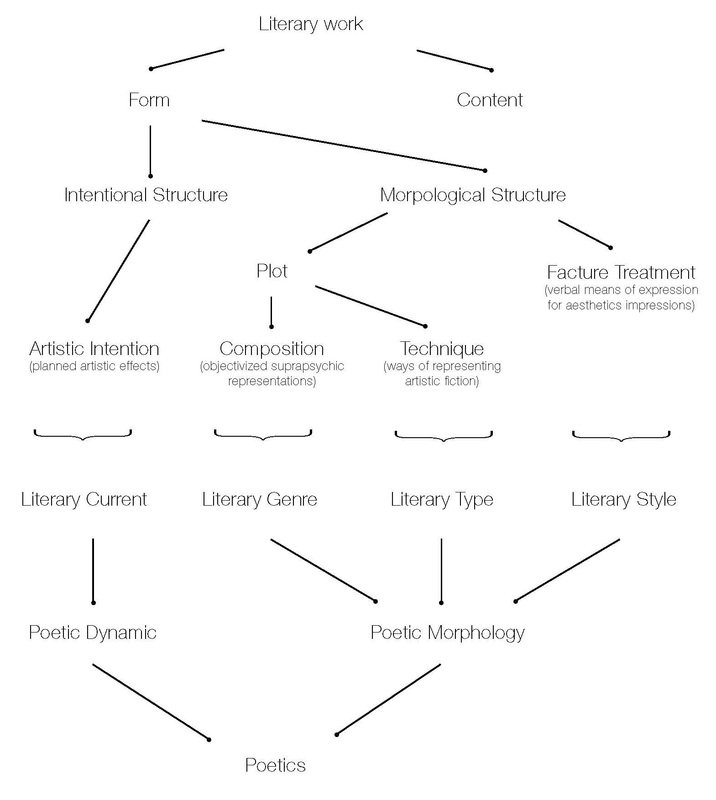 Plot as a fundament of literature is thus the thematic center of poetics as a discipline within literary scholarship and, furthermore, the foundation of distinctions among literary genres (whose singularity is determined by the compositional formations comprising the plot) and types (based on the ways of presenting fiction that are identified in the text). Types and genres are thus based on different criteria and, to the extent that they intersect, do not constitute a two-stage system. 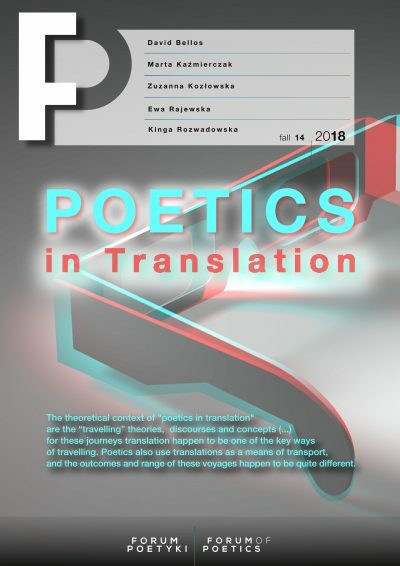 Poetics as a scholarly discipline, however, examining in its range separate problems: literary types, genres, and styles (left here, as I noted earlier, without what we would consider a satisfactory level of interest registered from Troczyński) and currents, encompasses, being a systematic field, the total sum of problems implied by the literary work as a work of art. What conclusions should we take away after reading this text, written by a young scholar from Poznań in 1928, as part of our studies in literary history today? Above all, we must admit that the text is impressive both by virtue of the method adopted and implemented by its author, and on the merits of the arguments it contains, presenting his vision of the discipline. The method of argumentation has two striking virtues: firstly, theoretical and literary-historical erudition (notable chiefly in the footnotes to the main text) does not interfere with the lucidity of the theorist’s argument; and secondly, his adherence to his stated aim of innovation in the proposal he makes for literary scholarship (plainly declared in the work’s introduction) is equalled by the clear-sightedness of the analyses he puts forth. Thus, the erudite panache and originality of his literary theory proposal find a balance in the proposal’s clarity and penetration. The specific, singular nature of this answer is sealed by the fact that the author of the text, growing out of the questions of the anti-Positivist turning-point, does not protect himself with the imprimatur of Dilthey or de Saussure. The result – as Seweryna Wysłouch has underscored – is outstandingly original in Polish literary scholarship, both with regard to the “generation of the fathers” – those who represent the “understanding humanities” (such as Juliusz Kleiner and Zygmunt Łempicki), and in relation to the proposals of his contemporaries who were inspired by structural linguistics (such as Franciszek Siedlecki, Kazimierz Budzyk, and Stefan Żółkiewski). Borrowings and quotations (mainly from Florian Znanecki’s Introduction to Sociology, but also from texts by Kazimierz Twardowski, Kazimierz Wóycicki, Jan Łukasiewicz, Tadeusz Grabowski, Michał Sobeski, Stanisław Brzozowski, and William James) serve clearly defined functions and are subordinated to Troczyński’s own ideas, in accordance with Znanecki’s doctrine of “considering only those problems posed by yourself.” Moreover, the text of Theory of Poetics, which devotes all its energies to treating the literary text as a work of art based on artistic values, formulates the text as the result of intentional objectivizations by the author, and finally defines “the objectivity of literature” as “the objectivity of the contents of our literary experiences” (p. 72) was written – we should keep in mind – before 1931, and thus before Ingarden’s groundbreaking Das literarische Kunstwerk! Nowadays we can also find in Troczyński’s theory the category of “experience,” valued in the contemporary humanities, together with his employment of the concept of modality, only recently mobilized in literary scholarship. “Who is the Konstanty Troczyński who wrote Theory of Poetics?” we can ask from a distance, heading to the archive years later to consult his authorial debut. When Troczyński spoke of Karol Irzykowski as a “poet of the fourth dimension,” he added penetratingly: “People are accustomed to turning thought into a comfortable rocking chair. Irzykowski passionately breaks the legs on those chairs.” I will venture the thesis that the author of Theory of Poetics, using these words to describe the stance of one of his masters, an authority, who, as he said admiringly, “frees thought from the duty to serve truth,” here simultaneously reveals his ideal of the scholar/artist, whom he desired from his earliest years to equal – something he was attempting to do with Theory of Poetics as well. He knows that thought is justified and empowered by its autonomy with regard to facts, not its solicitude toward facts. And he also knows that (nevertheless) the isolation of poetics from literature which he (as we see ever more clearly with time) is enacting with his courageous project is a way of enjoying that privilege. The reading of literary texts proposed by “pure poetics” will not provide us with answers to existential questions, will not help us understand Zeitgeist, will not offer us an interpretation of processes of social change. And yet it is worth engaging in, despite these limitations, or rather because of them. What for? Was Troczyński trying to be a contrarian? Certainly as a nonconformist he always liked to oppose whatever stood in authoritarian defense of universally accepted opinions and basic tastes. But there may be another, separate and more important factor that motivated the young Polonist, that could best be expressed in the words of the Irzykowski he so esteemed. Both scholar/artists liked “emotional states created at the heights of thought” and experienced them as poetry. Theory of Poetics, as an airtight theoretical construction, has its share of scholarly punctiliousness and cohesiveness, but for the same reason, it also has a share of artistic vision, later refined throughout the years in its details, both in the service of the ideal and in the interest of perverse delight. 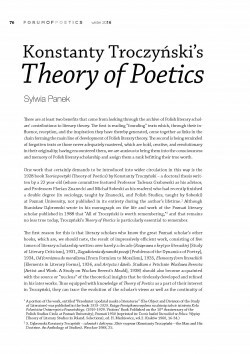 The article discusses Konstanty Troczyński’s Teoria poetyki (Theory of Poetics) – the Poznań scholar’s first book, with which he earned his doctorate, not published in his lifetime. In presenting Troczyński’s overall scholarly project, Panek presents it as an original response to the challenge of the anti-Positivist turning-point, a polemic both with Tainism and with the reaction to Positivism formulated in terms of the “understanding humanities” of the Baden School and Dilthey. S. Dąbrowski, Konstanty Troczyński – człowiek i doktryna. Zbiór rozpraw (Konstanty Troczyński—the Man and His Doctrine. An Anthology of Studies). Wrocław 1988, 25. The continuity of Troczyński’s thought has been stressed by S. Dąbrowski in “Od doktoratowego szkicu ku rozwiniętej doktrynie literaturoznawczej. Logika i dynamika drogi naukowej Konstantego Troczyńskiego” (From a Graduate School Essay to a Developed Literary Theoretical Doctrine. The Logic and Dynamics of Konstanty Troczyński’s Scholarly Path), Pamiętnik Literacki (Literary Diary) 1991, 1; S. Wysłouch, “Konstanty Troczyński – nonkonformista i nowator” (Konstanty Troczyński—Nonconformist and Innovator), introduction to: Konstanty Troczyński, Teoria poetyki i inne prace (Theory of Poetics and Other Works). Introduction and text selection by Seweryna Wysłouch, Klasycy Nauki Poznańskiej, ed. Alicja Pichan-Kijasowa, vol. 57, Poznań 2011; Łukasz Wróbel, “Konstantego Troczyńskiego ujęcie literatury faktu” (Konstanty Troczyński’s Grasp of the Literature of Fact), in: Hyle i noesis (Hyle and Noesis), Toruń 2013; Henryk Markiewicz writes about Troczyński’s line of development, which he describes as “difficult to read, since the author presented it in an abbreviated and extremely abstract form,” in his article “Teoria literatury i badań literackich w latach 1918-1939” (Theory of Literature and Literary Studies in the Years 1918-1939) , Pamiętnik Literacki 1979, 2. Consider K. Krassuski’s Normy i formy. Konstanty Troczyński teoretyk i krytyk literatury (Norms and Forms. Konstanty Troczyńki, Theorist and Critic of Literature), Wrocław 1982. T. Grabowski, “Polonistyka Poznańska,” in: 1919-1929, 7. M. Gorczyński, Prace u podstaw. Polska teoria literatury 1913-1918 (Work at the Foundations. Polish Literary Theory 1913-1918), Wrocław 2009, 105. Konstanty Troczyński, Pisma wybrane (Selected Writings), vol. 1. Studia i szkice z nauki o literaturze (Studies and Essays from Literary Scholarship). Edited by Stanisław Dąbrowski, Kraków 1997 (the manuscript of Troczyński’s text is located in the archive of Adam Mickiewicz University in Poznań, manuscript 208. K. Troczyński, Teoria poetyki; when published as a book, it was accompanied by two chapters of the previously published book: Od formizmu do moralizmu. Szkice literackie (Poznań 1935), “Intymność i forma” (Intimacy and Form) and “O istocie sztuki” (On the Essence of Art) as well as an excerpt from Artysta i dzieło. Studium o „Próchnie” Władysława Berenta (Poznań 1938). Compare Troczyński’s description of the idiographic approach on p. 39 of Theory of Poetics and his criticism of that approach on pp. 65-68. See L. Kołakowski, Filozofia pozytywistyczna. Od Hume’a do Koła Wiedeńskiego (Positivist Philosophy. From Hume to the Vienna Circle), Warszawa 2004, 16-17. Troczyński directly admits this to be an inspiration in the introduction to his book: “This study is an attempt to base a scholarly aesthetics of poetry on Florian Znaniecki’s philosophical principles of the human sciences (Troczyński, Teoria poetyki, footnote no. 18, 42). H. Markiewicz, Główne problemy wiedzy o literaturze (The Main Problems in the Study of Literature). Kraków 1996, 123 (on this topic, see also Dabrowski, Z zagadnień doktryny… (Some Issues of Doctrine), 25, footnote 19). See Troczyński, Teoria poetyki, 63, footnote 46. Troczyński names the following “invariable” elements of a literary work: action, structure, symbol comparison (See Teoria poetyki, 70). “A literary current is therefore a system of postulated, implemented and repeating artistic-literary intentions, relating to the morphological structure of literary types, genres, and styles” (p. 105). Troczyński defines plot as a “complex of presentations (words containing certain eloquent ideas), creating an artistic reality”; from it, it is possible to isolate “the component parts: structure, action, episodes, characters, images, descriptions” (p. 81). On Troczyński’s understanding of language as a kind of “shell” for content and specific valuation of language (treated as an aesthetic value) we read only in Elementach form literackich (Elements of Literary Forms); see S. Wysłouch, Konstanty Troczyński – nonkonformista i nowator, 22-23. O. Ortwin “Zagadnienie tragizmu w twórczości Wyspiańskiego” (The Problem of Tragedy in the Work of Wyspiański), Przegląd Warszawski (Warsaw Review), 1928, no. 25, 26. It is significant that Ortwin’s words are quoted byTroczyński himself in his text “Rozprawa o krytyce literackiej” (Treatise on Literary Criticism), Troczyński, Pisma wybrane, vol.1, 134 (footnote 21). S. Dąbrowski, Konstanty Troczyński, 47. See Wysłouch, Konstanty Troczyński, 21. Dąbrowski, Z zagadnień doktryny…, 48. Gorczyński, 105; on the subject of Troczyński’s proto-structuralism, see A. Jelec Legeżyńska’s article “Między formalizmem a strukturalizmem” (Between Formalism and Structuralism), Nurt 1976, no. 4. See Wysłouch, Konstanty Troczyński, 23. See Wysłouch, Konstanty Troczyński, 24. See Wysłouch, Konstanty Troczyński, 25. K. Troczyński, “Poeta czwartego wymiaru. Rzecz o Karolu Irzykowskim” (Poet of the Fourth Dimension), Dziennik Poznański (Poznań Journal) 1935, no. 9, 3. K. Troczyński, “Poeta czwartego wymiaru,” 3. On Troczyński’s attitude to life, see Konstanty Troczyńśki, “Człowiek – postawa – los” (Man—Attitude—Fate) in: Konstanty Troczyński – człowiek i doktryna; Cz. Latawiec., “Spotkania z Konstantym Troczyńskim” (Meetings with Konstanty Troczyński), Nurt 1976, no. 4; Wysłouch, Konstanty Troczyński nonkonformista i nowator. “Poetry is an emotional state that is created at the heights of thought,” says an aphorism by Irzykowski.